Yep, it seems pretty strange to talk about regional airports but having flown a good bit in the last couple of years I’ve come to appreciate even more the comfort of coming through my home airport, the Albuquerque Sunport. For many visitors this is their first glimpse of New Mexico. It’s only two levels with a couple dozen gates, basket weave brick floor, with a handful of shops and restaurants. Plenty of bathrooms and small enough to navigate easily. The New Mexico influence shows the moment you step off the jetway. Chunky furniture in “Santa Fe” style is a tip-off. But if you can, pause as you walk to the baggage claim and take in some the of artwork by famous and not-so-famous NM artists. Notably, don’t miss Dream of Flight by Lincoln Fox. 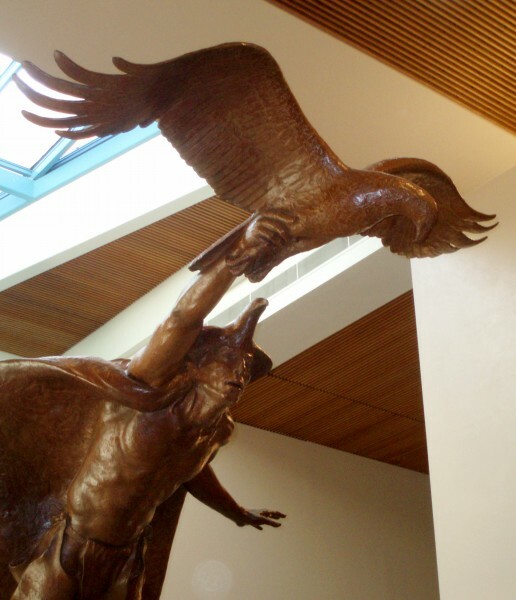 This life-sized bronze stands at the junction of the airport’s only two concourses and depicts an American Indian shaman with a flying eagle. 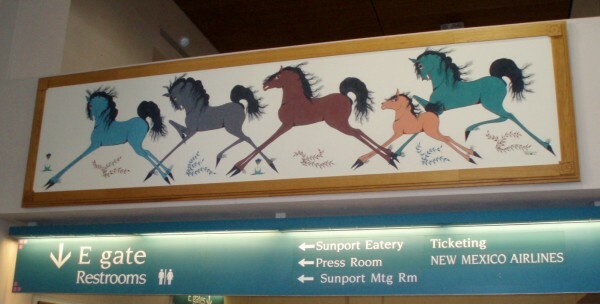 This entry was posted in Uncategorized and tagged airport, New Mexico, Santa Fe, travel. Bookmark the permalink.